Simply put, instead of being restricted to set appointments with a trainer or nutritionist, all your communication takes place online. From your initial consultation to your nutrition plans, everything is electronic. Historically, the only people who could benefit from our services, were those who could train with us in person. However, thanks to the marvels of modern technology, we’re now able to provide the same high quality programmes and coaching across the world. Many of our online clients lead busy lives and can’t commit to a particular time of day or even day of the week. Others simply don’t have access to world class coaching in their area. With our online coaching service, they don’t have to. Everyone knows that the top performers in any industry have coaches. Depending on the research you read, having a coach can improve your performance anywhere from 50-200%. There’s something inherently empowering about having someone focussed entirely on getting the absolute best out of you. In addition to the above, your coaches are literally only a few mouse clicks away. We’re not a high volume business, as the quality of our service really matters to us, so we’ll always do our best to get back to you as quickly as possible. That’s right, we will get back to you. Not some minimum wage employee who’s simply paid to administer memberships. Working with a coach online means modifications are quick and don’t necessitate any additional consultation fees. Plus, no fixed appointment times in the gym, means no late/missed sessions or cancellation fees. Having a bespoke coaching service not only means we’ll accommodate your current style of eating meaning no shocks to the system, but your workouts will be designed for you specifically, rather than one size fits all. As experts in our field, we want you to have no confusion over what diet or plan to follow and have the best and most up-to-date advice available. There’ll be no faddish exercise routines, just scientifically and practically proven programmes designed to get you results as quick as possible. In terms of nutrition, every element of every habit you’ll adopt is explained in detail and supported with handouts and guides, meaning you don’t have to guess at anything. 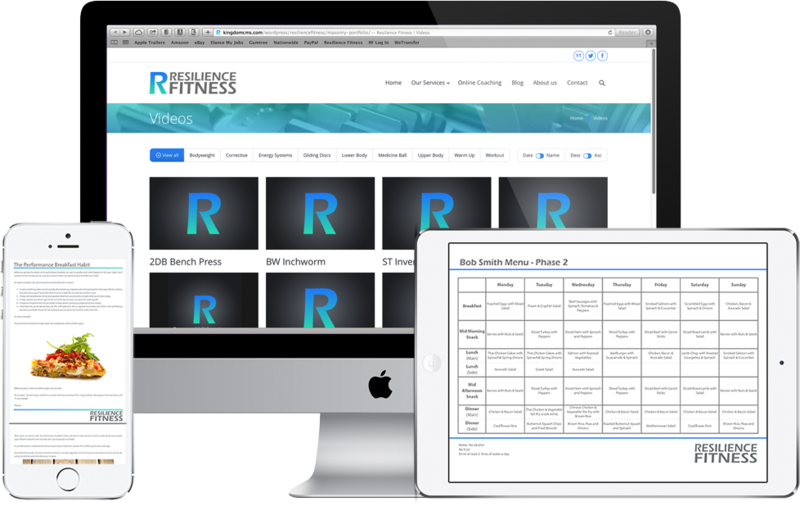 Each rep, set, rest period and exercise is carefully planned, with online videos for exercises, meaning you’ll never work out unsure of what to do again. 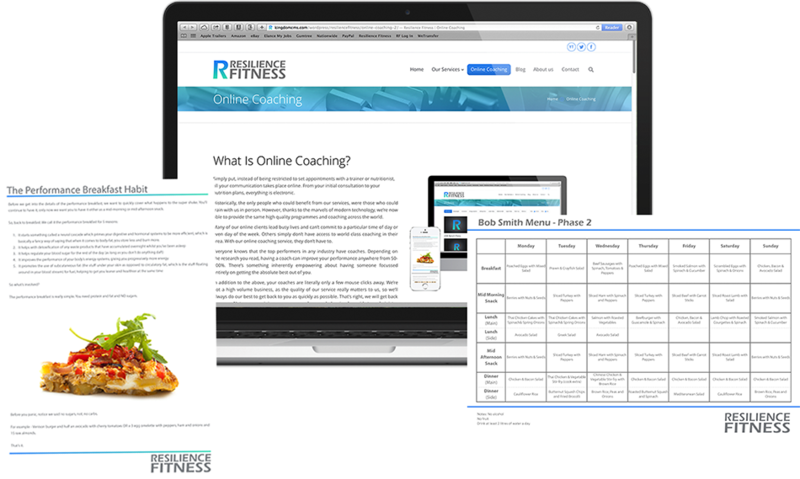 We’ve had online coaching ourselves from some of the best providers available and most of them use ready-made templates. In fact, some of the most commercially successful online coaching services in the industry, gives all of their clients the same workouts. That’s right, the same workouts, not just the same exercises, but the same everything, regardless of experience, skill or preference. Not only that but the cost is well in excess of £100 a month. Now in fairness, some of them are good systems, and they do get some good results (typically those are the ones on their websites), but there are a lot of people who just don’t want a one-size-fits-all approach. That’s why every programme we write is written from start to finish, for each client individually. In addition to which, no two clients will ever be coached the same way for a particular habit or exercise programme. That’s right, no two coaching clients will ever progress through our habits the same way. We don’t care what your goals are or what your level of experience is, only what the difference is between what you’re currently doing and what you need to be doing to achieve the results you’re after. Once we’ve established that, we’ll coach you based on what’s required to move you forwards. Every client gets a Nutrition and/or Exercise plan designed specifically for them, (so if you share it with your friends, it probably won’t work as well for them as it will for you). You’ll also get a series of nutrition and exercise handouts covering everything from how to stay fit on holiday to the best way to cook a steak. You’ll also have regular reviews (at least every week) to determine the best way to move forwards and ensure maximum results. You get unlimited email support, (within reason of course, we’re not actually available 24/7 as we have our own families and workouts to take care of). You get world-class advice and that’s not just our opinion. Jeremy presents all over the world to trainers expecting the most unbiased and up-to-date advice to pass on to their clients and writes training courses for some of the top education providers in the industry. Sarah assesses trainers for Les Mills International, the world’s largest group fitness organisation, ever. From your habits to bespoke food plans and recipes, it’s all done for you. Plus you’ll get guides on shopping and cooking. No more guesswork. Every rep, set and rest period is detailed clearly in your programme. Whether for general health or something more specific, we’ll tell you what supplements you need. You’re always a click of the mouse away from the answers to any questions you may have. Most people are familiar with the basics, but to make sure your technique is good, there’s video support too. We’ll help you track your progress and provide regular feedback on how you’re doing. You can feel confident you’re doing the right thing, as our advice is second to none. Both the 6 and 12 month options include our express detox programme worth £157.